Be the first to share your favorite memory, photo or story of Jimmy. This memorial page is dedicated for family, friends and future generations to celebrate the life of their loved one. 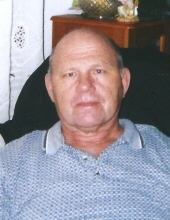 A Bardstown resident, Mr. Jimmy Larry Stone, age 72, passed away Friday, April 12, 2019 at Hardin Memorial Hospital of Elizabethtown. He was born on January 30, 1947 in Crestwood to the late Allen Seymour and Betty Allen Stone. Jimmy was a former employee of Gates Rubber Company for 35 years, was a hard worker, good husband, father and grandfather. He was a member of St. Joseph Catholic Church. He is survived by his wife, Wanda Spalding Stone, 2 sons, Jimmy Dale (Tomi) Stone and Nicholas Stone both of Bardstown, a daughter, Kim (Zack) Weis of Louisville, 2 sisters, Brenda Gray of London, Barbara Beaty of Springfield, 3 brothers, Jerry (Diane) Stone of Cleveland, Ohio, Timmy (Ellen) Stone and Donnie (Lois) Stone both of Cadiz. Jimmy is also survived by 6 grandchildren and 10 great grandchildren. Funeral services for Mr. Jimmy Stone will be 1:00pm, Monday, April 15, 2019 at the Houghlin-Greenwell Funeral Home with Fr. Peter Do officiating. Interment will be in St. Joseph Church Cemetery. Visitation will be Monday from 10:00am-1:00pm at the Houghlin-Greenwell Funeral Home, 1475 New Shepherdsville Rd., who is in charge of arrangements. To send flowers or a remembrance gift to the family of Jimmy Larry Stone, please visit our Tribute Store. "Email Address" would like to share the life celebration of Jimmy Larry Stone. Click on the "link" to go to share a favorite memory or leave a condolence message for the family.